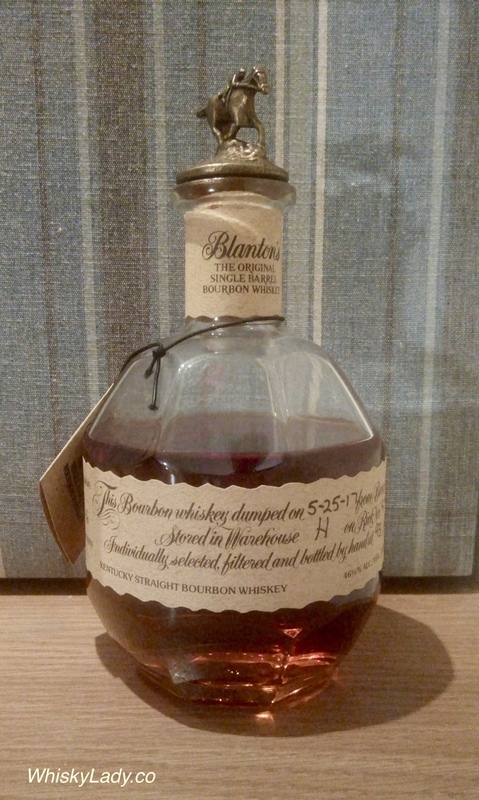 We shifted from single malt back to Bourbon with the reliable Blanton’s… it was by no means most of our first brush with Blanton’s… a few shared when in doubt, it is always safe to reach out for this bourbon. From Buffalo Trace, Blanton’s is a traditional bourbon made of corn, rye and barley… from warehouse H.
And what do the folks over at Buffalo Trace have to say? Nose – A deep, satisfying nose of nutmeg and spices. Palate – Powerful dry vanilla notes in harmony with hints of honey amid strong caramel and corn. Finish – A medium finish composed of returning corn and nutmeg flavors. What all did we sample in our mostly Bourbon night? This entry was posted in American, Beyond Scotland and tagged Blanton's, Bourbon by Carissa Hickling. Bookmark the permalink.